If the public really embraced these new markets, what functions might be possible? 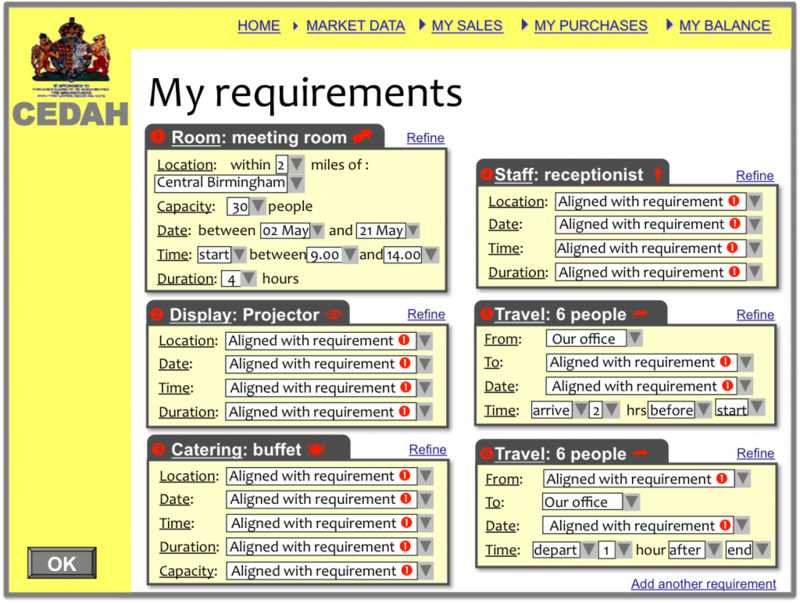 Imagine you run a one person business in a region or country with CEDAH. You have several potential clients in a town 100 miles away. In the next three weeks you want to host a sales seminar there. You will need a room, projection equipment, some catering and a receptionist to greet everyone. A clutch of existing customers will also need to be transported to the venue. 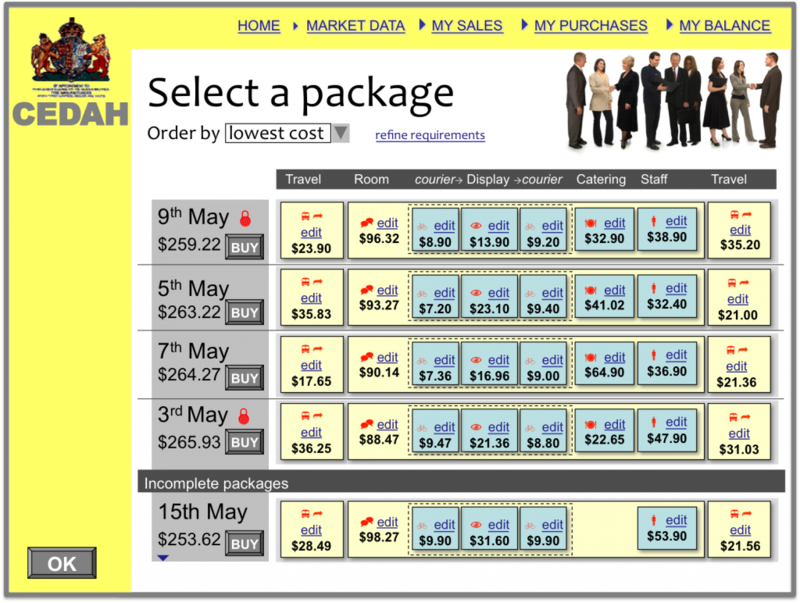 CEDAH can search across its thousands of sectors to pull together aligned packages for a buyer. It looks for available meeting rooms which could belong to any community association, company or government body that had no meetings that day. Then it searches around the locality of each room for a projector (where there is not one listed at the room) and a courier to get it to/from the meeting in each case. The time of a caterer and an eligible receptionist are likewise located. Travel could be from a cab firm or an insured local with a people carrier. There is enormous complexity behind this transaction. CEDAH could be underwriting each package. For example: if your projector is not available on the day, it can use an internal levy on purchases to fund the booking of a last minute replacement and re-route the courier. If any link in the chain fails, CEDAH can re-structure instantly. Sellers have every incentive to tell the system if a problem is emerging, their reliability ranking is at stake. If all else fails, you can inform the system of a problem and it will work-around immediately. You don’t need to know how any of this works, just as you remain unaware of how Amazon robots move stock around distribution centres to ensure such swift, reliable, cheap dispatch. You just select a package, accept the standard contract which has been merged to cover all the transactions and know it will somehow all happen as you expect. The popularity of “Collaborative Consumption” has spawned countless web markets. Most fail to achieve their objectives. Whipcar, once the UK’s leading peer-to-peer car sharing marketplace is a case in point. They suddenly ceased trading in March 2013. It’s possible such challenging markets are only viable as one part of an interlinked mass of markets sitting on a common platform. Buyers can see what cars are available around them at any time. They might specify the price include delivery and collection by someone insured to sell in the local vehicle deliveries market. Why should this model work where Whipcar couldn’t? Official facilities can de-risk transactions. Databases of roadworthy vehicles, driving licences and valid insurance can be definitively checked before each hire. Buyers and sellers have stronger incentives to act responsibly. 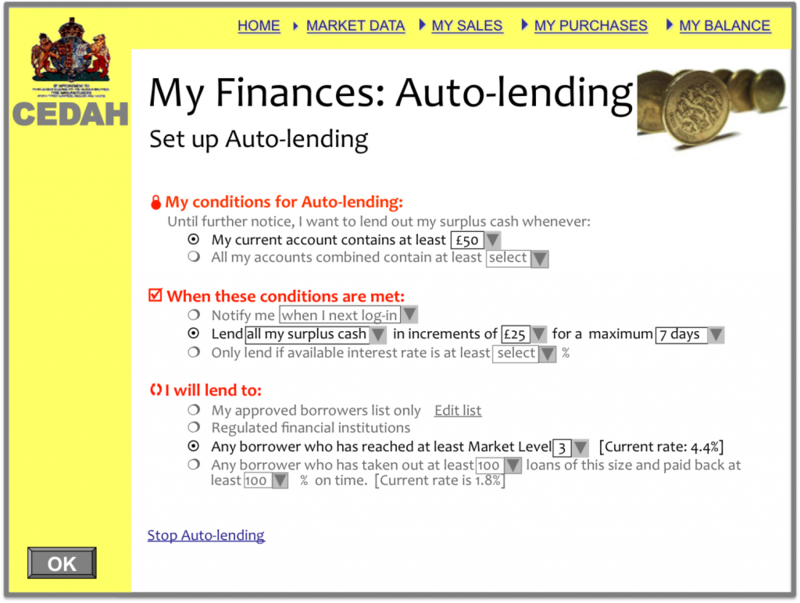 The scale of CEDAH means your reliable trading record is like your driving licence. If you lose it through bad behaviour it severely curtails your life opportunities. The ultimate mechanism by which you lose it, the courts, is accountable and transparent. This is not about risking bad ratings within one website dependant based on people making subjective judgements about you. Interlocking markets drive volume. Many renters don’t just need a car, they also want overnight accommodation, a roof rack, an activity at their destination or other linked purchases. Stand-alone web markets can only provide one part of that puzzle. CEDAH just treats the list of needs as an interlinked transaction as illustrated above. CEDAH’s financial exchanges can include hour-by-hour micro-insurance with price fluctuating for each risk group in line with supply. Registration completed. 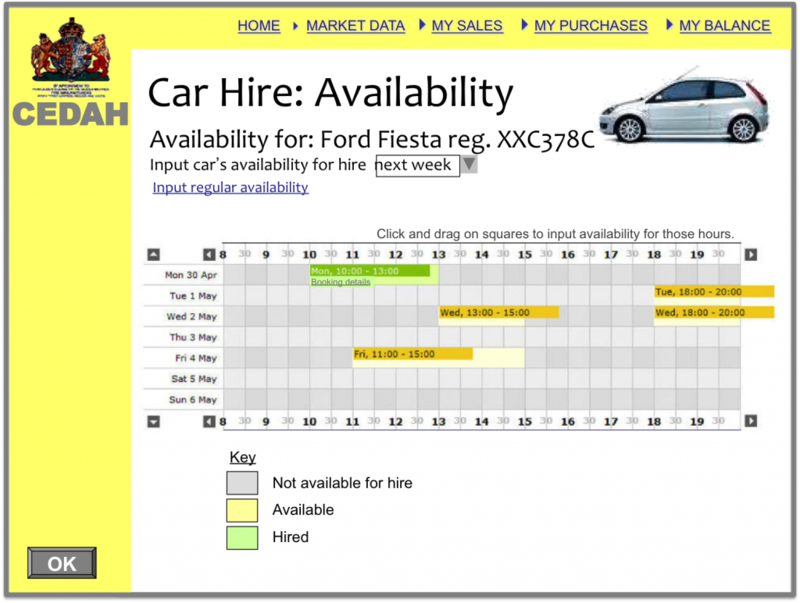 Registering for Whipcar took time with little idea of whether the site would end up meeting your needs afterwards. You may have registered with CEDAH initially to sell your services as a relief paramedic or access its hire of golf clubs, but you are then one click away from putting your car in the market. 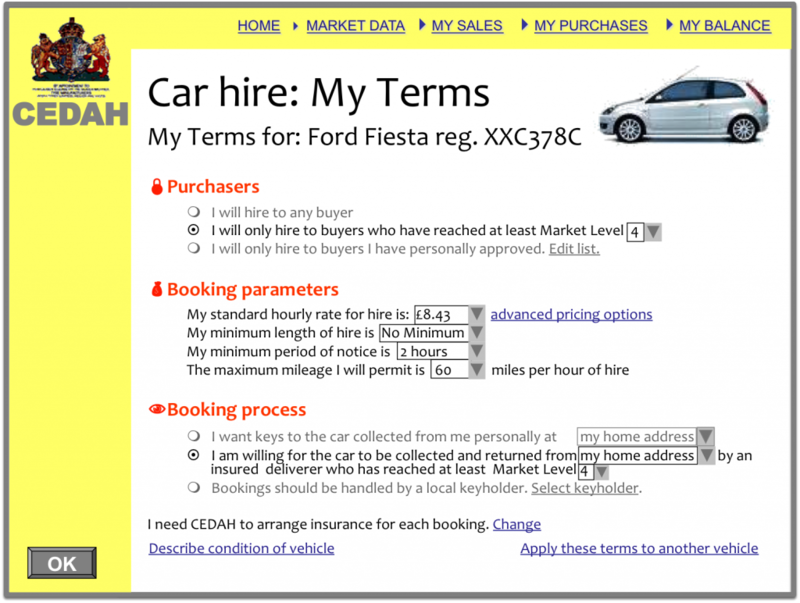 Another click gives CEDAH permission to check your vehicle related records in official databases. Universal supply. CEDAH is a neutral channel, as open to Avis, Hertz or Zipcar as to the ordinary citizen. The system simply finds the best options for a buyer’s need and monitors everyone’s reliability. Big vendors would be likely to dominate around airports and stations, but it’s a level playing field at community level. CEDAH might be mandated by policymakers to maintain an average transaction size of perhaps $50. That would keep it focused on fiddly, low-end, very local transactions and less threatening to established players. If central government really wanted to give citizens the best possible e-markets, they could expand permissions for this kind of system so it can leverage its records of reliability into financial functions. That creates a kind of national e-markets system. It could revolutionize peer-to-peer finance. The system might be given permission to operate as a narrow bank. 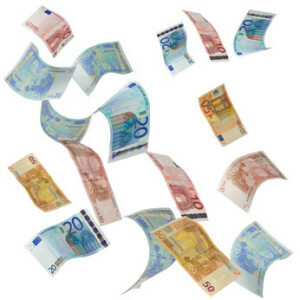 It could very cheaply offer each user a current account into which earnings through the system are paid. From that they could lend, insure or invest through internal exchanges. Each user decides whether to deal only with provenly reliable users who, of course, will only generate low returns. Digital cash earned within CEDAH could be transformed into notes and coins by a new model of community banking. Anyone might be able to set up in a public place with a mobile phone and a full wallet. Approach one of these vendors, use their phone to instruct CEDAH to pass $50 from your account to theirs, the system gives them a confirmation password. They then give you $50 in cash. Their next customer may deposit notes into their digital account in a reverse of the process. The provider will also directly deduct a competitive fee, which an ATM would not. But you are free of regular bank charges, paying only the local market rate for each interaction. Some providers might provide an on-call doorstep service. One click brings the cash to meet you. But, if you are willing to walk, the system can generate a map of local cashpoints of the moment. Some of the above functionality may seem implausible. But the overheads borne by small businesses, the need for radical urban transport solutions and the inequity of payday lending are all powerful drivers for change in their sectors. CEDAH tackles all that and more. Online services have a history of surprising adoption rates if launched with enough clout.